This is a place the kids will keep on coming back for more. The Kiddie Park currently offers a wide variety of 18 rides and attractions. This is a little carnival type place with miniature roller coaster and Ferris wheel among other ride, cheap, the cotton candy is cheat and sweet, and the little ones love it. Kiddie Park is an icon in Bartlesville, a great place to take your kids or grand kids. 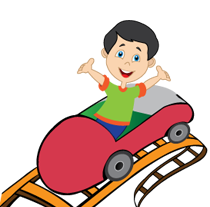 Kiddie Park offers kiddie rides, roller coasters, thrill rides, and transportation rides.For more than 60 years, parents have taken their children to this park to create memories that last a lifetime. If you've never been, it's adjacent to Johnstone Park, which has tennis courts, a skate park, a playground and more. Kiddie Park currently doesn't have discounts or promotion. Click here to visit their website and stay updated.